The Karkinos (kark-EE-nohs) is one of the Creatures in the Aberration-DLC of ARK: Survival Evolved. It is useful for picking up wild animals and carrying them to a taming pen, as well as general combat usage or a source of Organic Polymer. The Karkinos wanders the waters of Aberration and is aggressive toward land-based creatures, and given its large size, it can prey on much bigger predators than most of the other aquatic creatures. Surprisingly despite its size, Karkinos can also be found in the rivers of artifact caves. The Karkinos is a large amalgamation of various arthropods, most noticeably the spider crab, having elongated limbs with occasional on them. The legs are almost skeleton-like. The head appears to be similar to that of a harvestman's. The most unusual feature is the two pairs of claws. The extra pair is placed above the head. This section displays the Karkinos's natural colors and regions. For demonstration, the regions below are colored red over an albino Karkinos. The colored squares shown underneath each region's description are the colors that the Karkinos will randomly spawn with to provide an overall range of its natural color scheme. Hover your cursor over a color to display its name and ID. For example, "cheat SetTargetDinoColor 0 6" would color the Karkinos's "body main" magenta. This section describes how to fight against the Karkinos. The Karkinos attempts to grapple you and repeatedly slam you into the ground. Stay away from the front of the creature, as it can pick you up and immobilize you as it turns you into a tasty snack. Underneath its belly or directly behind it are the best positions to maintain. Try to attack the legs. Spinos are generally the best dino to attack it with, since it cannot lift you off of a Spinosaurus. Avoid utilizing early primitive weapons such as Bow and Slingshot (it will take a very long time). They do little to no damage towards the creature, even if struck through the limbs. They often roam the water, and can make fishing a dangerous task. In addition to this, their attacks can hold you underwater and cause you to drown. Regardless of the dino you are mounted on (except large dinos such as Rock Drake, Reaper and Spino), Karkinos may attempt to grab you off the mount. Unless whistled to attack immediately or using Whip, it is a guaranteed death to whoever gets grabbed on its claws as it will never release the grabbed beast/survivor from its claws unlike Megalosaurus unless it has sustained a lot of health loss that forces its grasp off or if you flash/stun it by using a Plant Species Z Fruit. The Karkinos has a giant hitbox and a small attack range for its size, leaving them unable to hit a Spinosaurus using properly-timed attacks that can stagger the Karkinos. They are also quite slow so you can kite them around fairly efficiently. Much like a Rock Elemental, Karkinos cannot be knocked out with the traditional arrows, darts or animal torpor attacks; instead requiring weapons like the Catapult Turret or Cannon aimed at the main body. Hitting the limbs instead of the crab's body will deal heavy damage to the creature instead of applying torpor, so aim carefully. A few misplaced shots, especially with the cannon, can easily kill the Karkinos, or render health so low that the taming attempt will have to be abandoned until it recovers. Due to the difficult aiming mechanics of the cannon, and the cost of ammunition, it is recommended to use a catapult turret instead, being both more cost effective and far easier to aim. One catapult shot deals roughly 400 torpor, and with a high rate of fire, the turret can easily outpace the cannon in terms of how quickly torpor is applied. 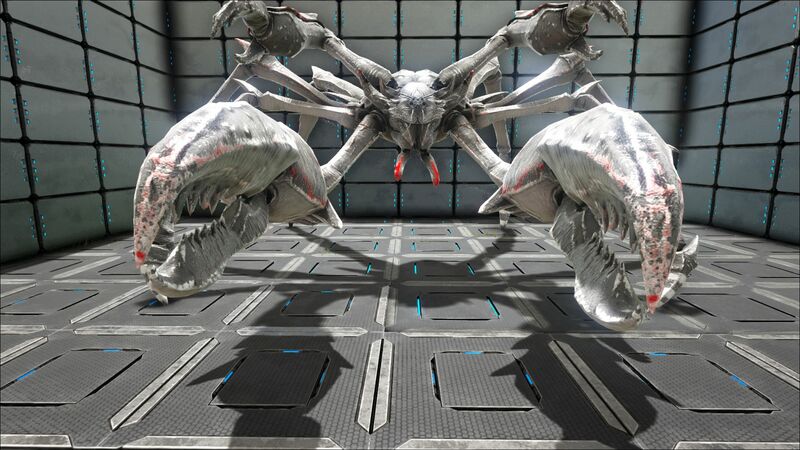 One method of bringing down a Karkinos is placing a Catapult Turret on a platform saddle; the only candidate in Aberration, which just so happens to have the perfect height for this role, is the Paracer. If positioned just behind the rider's seat, the catapult is able to shoot almost directly down behind the Paracer's rear, which is typically where a Karkinos will be if the Paracer is made to face away from it. While attempting this strategy, be sure your Paracer is set to passive, and that the Karkinos is first targeting the Paracer instead of you before dismounting to climb onto the catapult. With careful aiming, a Karkinos can be easily, and safely knocked out from atop your Paracer's back. One of the few drawbacks to this strategy is that Karkinos will often attempt to flee once their torpor reaches a certain point, but a catapult's quick firing rate gives you a decent window to land the knockout before it has the chance to run. 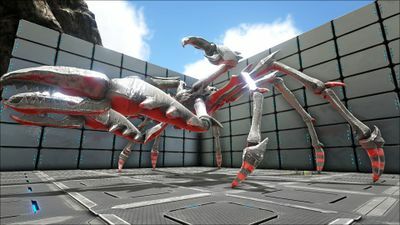 Building a stone trap out of dinosaur gates or pillars is the most reliable method of taming a Karkinos, despite the resource costs associated with it. Karkinos tend to move around quite a lot, and are quite difficult to aggro onto you. While this presents a challenge either way, building a trap ensures that the Karkinos can't run away at high torpor, or aggro onto another creature. Trapping a Karkinos can also prove difficult, as they are capable of jumping over and out once contained, and trying to shut the trap can easily result in a survivor being grabbed by the crab, causing a swift death. There is the added disadvantage that said traps are stationary, and cannot be moved, sometimes causing you to lure the desired Karkinos over long distances before it can be trapped. If you choose to build a trap, build a three to four wall high tower near to it on which to place the catapult for aiming down. Be aware however that once a Karkinos is closed in, it can behave erratically; turning in all directions as it attacks the enclosure, sometimes making it difficult to land a good shot. A good time to take the shot is when the crab is facing away or towards you, as less limbs get in the way of your strike. Although being a bulky creature, this creature makes up for it with its ability to jump and to pick up medium-sized creatures. c: Throw creatures held in either claw. Can hold to aim and charge for much farther throw. spacebar: Jump. Can hold to aim and charge for much larger jump. Can repeatedly jump vertically while in the water. Animal transporter: Given the lack of fliers that can carry wild animals to and from different locations, the Karkinos is the Aberrant Ark's best method of transporting animals, and unlike the two other terrestrial carriers, the Kaprosuchus and Megalosaurus, it is able to pick up tamed creatures as well as wild ones. Not only capable of picking up just one, but two creatures at once, the Karkinos can even throw, as well as jump while holding them. This helps to ease the burden of getting creatures across gaps or up cliffs in the rugged terrain of Aberration. Water Exploration: The Karkinos, lacking an oxygen stat, can survive underwater without needing to surface for a breath, and when it is within deep water, it will sink and walk along the bottom with ease. While submerged, the Karkinos' jumping ability switches from a charged target jump to a straight vertical shot, and can be repeated even without touching the ground. This allows the rider to quickly surface when in need of oxygen, and then quickly sink back to the bottom. While touching the bottom, the rider can dismount, and the Karkinos will not wander off towards the surface in search of land like some other ground based mounts. While there is only so much deep water within the Aberrant Ark, the Karkinos is an excellent choice for aiding in dives for Silica Pearls, and is more than capable of defending itself and its rider during this endeavor. Radiation Zone Explorer: Most animals native to the Aberrant Ark are immune to radiation damage, and can safely explore these zones. The Karkinos however, has a distinct advantage over many of the other mounts that can go within these areas, which is filled with cliffs, high ledges, and many gaps that have to be navigated around. Although slow when it comes to running, with its ability to jump, the Karkinos is just behind the Reaper and Rock Drake when it comes to the ease in which it can navigate these areas. Mobile Taming Pen: With the Karkinos' ability to pick up and hold creatures, coupled with the fact that the rider can wield weapons while on the back of one, the Karkinos is perfect as a mobile taming assist. 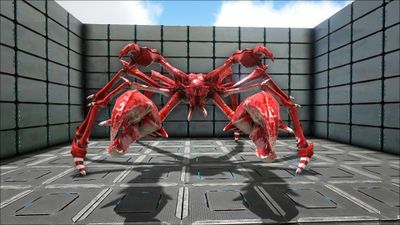 Provided that the held animal is positioned where it cannot hit the Karkinos, or can only hit occasionally, the rider can easily tranquilize the captured animal from atop the safety of the Karkinos' back. Take note that wild Megalania and Ravager will attack back when held. The torn dossier for this creature was first revealed on November 11, 2017. "Karkinos" is the Greek name for the constellation Cancer. Like the Pulmoniscorpius, Karkinos can be tamed with spoiled meat if the player has no kibble. After taming, spoiled meat provides more Food than raw meat. Tamed Karkinos will automatically eat spoiled meat first regardless of other meats in its inventory. Karkinos receives 10 points of health per unit of spoiled meat eaten, allowing it to recover health by force-feeding twice as quickly as most tames. 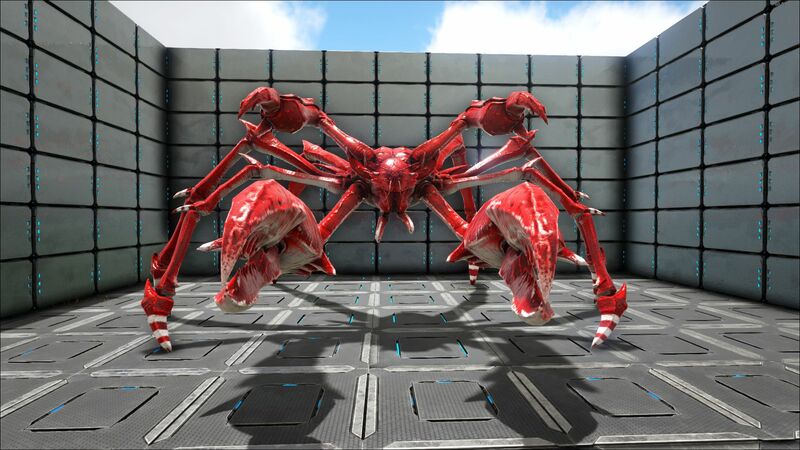 Leveling a tamed Karkinos makes it do what appears to be a "crab dance"
Whether Karkinos can carry a creature is based off that creature's drag weight; Anything with a drag weight of 250 or below is able to be picked up by the Karkinos. This can sometimes be confusing if two creatures with different drag weights are a similar size in game. For instance, while Stegosaurus and Roll Rats can be carried, Megalosaurus and Triceratops cannot, as their drag weights are 350 and 300, respectively. Be careful when fighting a Sarco in the water, as it can get underneath the Karkinos, causing it to be stuck and unable to fight back. Oddly enough, Karkinos' upper pair of pincer limbs were never used for anything in game other than for aesthetic purposes. "Karkinos Versatus" translate into "Veteran or Experienced Crab"
Karkinos is one of the only species where the first part of the species’ name (karkinos), is the common name. The Karkinos appears to have a bug associated with the landing after a jump which rarely results in the game crashing (tested on PC). This can be quite dangerous when travelling in hazardous areas, and should be taken into account when considering its use as a combat mount. Karkinos are one of the three dinosaur that can only be knocked out through striking at certain parts of its body with blunt/explosive projectile, others being Rock Elemental and Titanosaur. Unlike most arthropods in the game which tend to bleed green, Karkinos bleeds a light blue colored blood similar to the modern horseshoe crab.